Soar off a mountain from 3000ft and land on a beautiful beach with this tandem paragliding adventure. 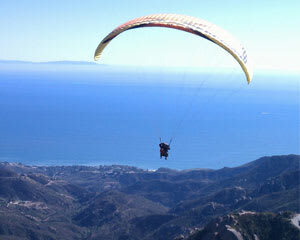 A paraglide is a lightweight, foot-launched aircraft comprised of a non-motorized inflatable wing. Paragliding offers ample maneuverability to take in the beautiful coastal sites and experience some thrills at the same time. Paragliders are designed to go up and not down, so they are light and aerodynamic. If you want to experience Malibu from a different vantage point than the sandy beach, then this tandem paragliding experience is for you. Not your typical "tourist" event! The experience was a blast but be prepared for adventure, more than light physical effort and where good tennis shoes.